Water Conservation Minimal Water. Abundant Beauty. Trained by the Marin Municipal Water District in water conservation, Equinox Landscape is skilled at balancing beautiful landscapes with water conservation. Marin and Sonoma Counties face water shortages routinely, causing the price of water to continually increase. To manage the use of water in your garden, your irrigation system should have a rain gauge and a timer that is programmed at different seasons to ensure a reliable source of water for your trees, flowers and shrubs, without over- or under- watering. Satellite controlled irrigation systems with soil sensors are also available to get exact watering needs for different parts of your gardens. But even the best irrigation systems eventually need maintenance. Punctured pipes, broken sprayer heads, timers malfunctioning are just some of the problems that occur over the years. In addition, relocating plants may require an adjustment to or replacement of your irrigation system as well. At Equinox, we have trained staff who specialize in meeting your irrigation needs. Of all the water-saving measures a homeowner can take, a laundry-to-landscape greywater system is the smartest. It is inexpensive, requires little maintenance and is ongoing due the continuous creation of greywater in our homes year round. Laundry-to-landscape greywater systems route water from the washing machine out into mulch basins that surround the roots of trees, shrubs and perennials that need watering. The water filters through the soil to the roots of the plants, taking care of their irrigation needs. A hand-activated 3-way valve allows homeowners to decide when the greywater goes to the garden or to the sewer. Free water falls on your property every rainy season. If your landscape is like most, this water is ushered off the land into storm drains and sent to surrounding creeks, streams or rivers and eventually into the Bay, taking with it toxins like car oil and pesticides which pollute our waterways and kill marine wildlife. When the rainy season is over, you then pay for water that is treated with chemicals to get sent back to you to water your landscapes. Seems wasteful doesn't it? 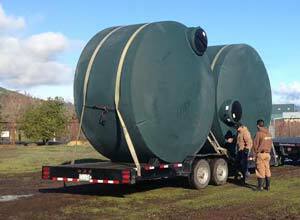 Rainwater harvesting captures rain for on-site use, free of a monthly charge and free of chemicals. It can be done with Earthworks or with water catchment systems. Earthworks, (see below for a full description,) keeps rainwater on the property so that it can soak into the soil and raise the water table, thereby diminishing the need for irrigation. Rainwater catchment uses the downspouts from rooftops to catch and store rain in tanks (above or below ground) for later use. Harvesting rainwater creates a more sustainable source of water for landscapes and when stored can also serve as a source of water in the case of an emergency. Rainwater harvesting can save you thousands of dollars in water bills over the years while simultaneously conserving a valuable resource. For more information about rainwater harvesting, visit www.harvestingrainwater.com. Earthworks is an ancient strategy of directing and collecting rainwater through the topography of the soil. It is the foundation of a sustainable landscape, as it supports a system less dependent on outside water sources. 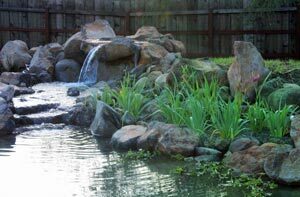 Earthworks incorporates the use of swales, berms and basins, contour plantings and vernal ponds to slow water, spread it out and sink it into the soil. It can be the cheapest and most effective way to slash water bills, reduce the use of nonrenewable water supplies, decrease down-slope flooding, and improve water quality. While the term rain garden may conjure up images of ponds and waterfalls, a rain garden is actually a garden that is designed to capture run-off from impervious surfaces such as parking lots, roof tops and patios and filter contaminants through its soil and plantings. 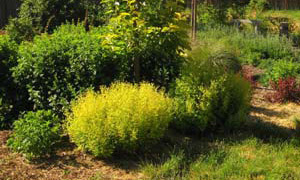 A rain garden can be a beautiful addition to a landscape with many benefits: it cuts down on the need for irrigation, helps raise the aquifer and reduces the amount of pollutants reaching creeks, streams and the Bay. Rain gardens are planted in a depression (anywhere from 4" up to 2' deep) and use a mix of native flowering perennials, grasses and shrubs that are low maintenance and increase wildlife and biodiversity. Root systems from the plants help filter toxins as water slowly percolates through the soil layers. Installing a rain garden can be one of the easiest, most cost-efficient things you can do to reduce your contribution to stormwater pollution. 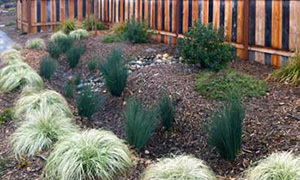 For more information about rain gardens, visit www.raingardennetwork.com. Fifty to sixty percent of fresh water in California is used for landscape irrigation, most of which goes to keep lawns green. Many cities and counties now offer "cash for grass" rebates for replacing existing lawns with native or low water use gardens. Converting a lawn can save hundreds of dollars in water bills and simultaneously help create biodiversity. Replacing a lawn does not require hauling old sod to the dump. Existing lawn can be covered with sheet mulch and planted. Sheet mulching consists of layering compost, cardboard and mulch to block out sunlight and kill the lawn. The sod slowly composts with the cardboard over time, regenerating the soil with nitrogen. New plants can be planted right into the sheet mulch, which instantly gives them a layer of mulch that helps keep moisture in and weeds out. If you are interested in our Water Conservation Services, please call us at (415) 456‑6480 in Marin or (707) 789‑9786 in Sonoma to arrange for an appointment.